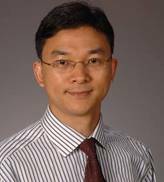 BERLIN, GERMANY: Dr. Guanghui (George) Lan, Assistant Professor of Industrial and Systems Engineering, has been named one of three finalists for the Tucker P rize for 2012, which will be awarded at the opening ceremony for the International Symposium on Mathematical Programming. This award is given to an outstanding scholar based on his or her doctoral thesis. In order to be considered, an awardee must be nominated by a faculty member of his or her alma mater. The Tucker Prize committee reviews all nominations and chooses three finalists, as well as the winner, which will be announced on August 19th. Lan received his Ph.D. from Georgia Tech.